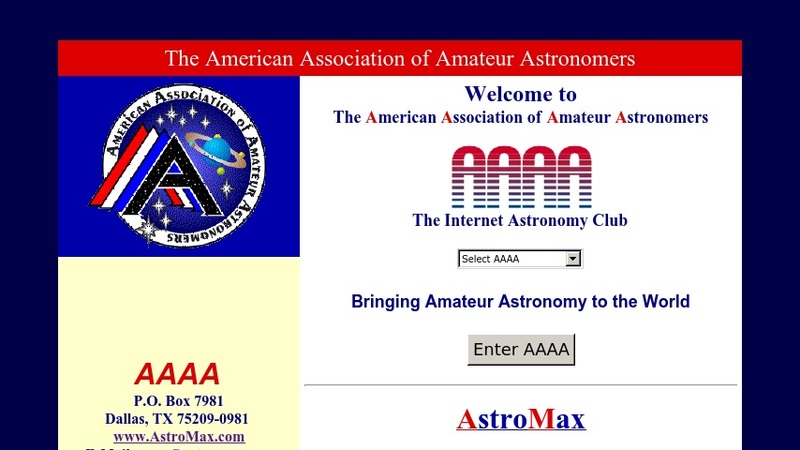 The American Association of Amateur Astronomers (AAAA) is intended to foster interest in amateur astronomy by developing and promoting programs for its membership and the amateur community at large in the areas of observational astronomy and electronic communications on the internet. The AAAA's web site features links to membership information, news releases, and announcements of astronomical events and organizational activities. Educational materials include a tutorial on the solar system, an introduction to the constellations, a history and introduction to astronomy, and a link to the Arp Atlas of Peculiar Galaxies. There is also an FAQ feature, a link to the organization's newsletter, links to partner organizations, and information on products available at the AAAA online store.